Last week I mentioned that I spotted the prettiest blush mini-binder at The Container Store. 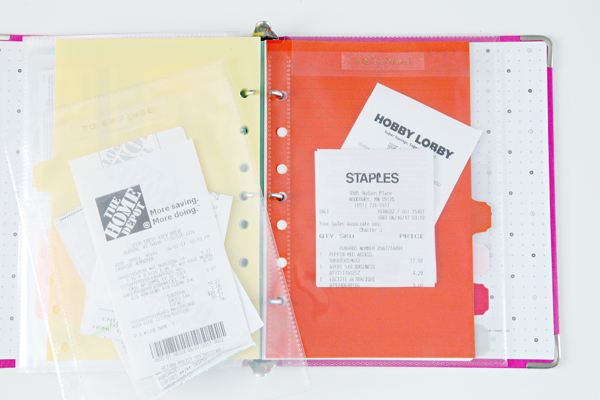 I also mentioned that I love those fantastic mini-binders for organizing my coupons and receipts. And then I realized that I have been using the mini-binder organization for awhile now and I have yet to show you! Between feeding a family of five and working on home organization and DIY projects around the clock, I run a lot of errands. Given my location, I try to consolidate my trips whenever possible. I live 20-60 minutes from the majority of my favorite shopping sources so I will typically hit up HomeGoods, Home Depot and a couple grocery stores all in a single outing. 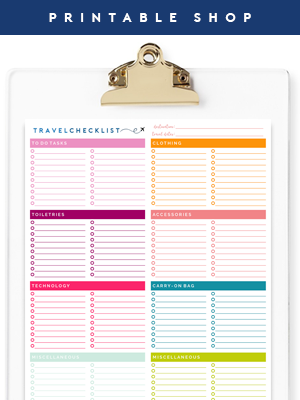 Over the years I have attempted to organize my trips and handbag with a variety of checklists and pouches. 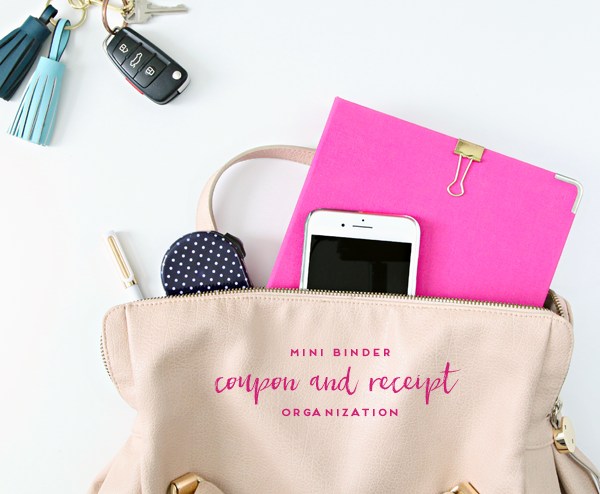 Expandable files for coupons, envelopes for receipts, a small card holder for store cards and folded stacks of ideas and lists. Each individual attempt has been OK, but when combined it just created a jumbled mess inside of my purse. Or things would get misplaced, and transferring the items between totes would cause some to become separated from others. 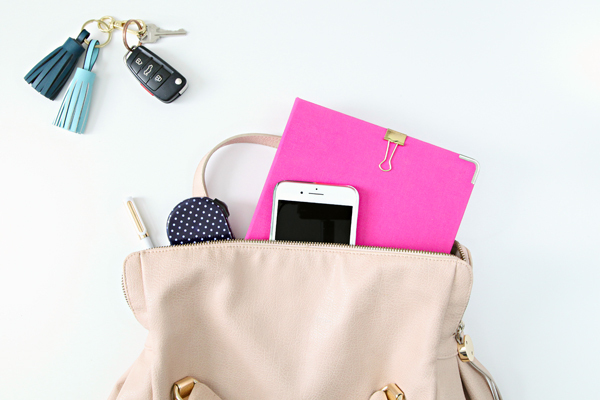 And sometimes the pouches and lists would get left in the car and then I would end up in our other vehicle. Not the end of the world, but I really wanted to find a way to keep everything together in one harder-to-lose organizer. Maybe my situation is unique and not everyone will have the same needs as I do, I know many of you rely upon on your device when out and about, I am just not 100% there yet. That said, I did want to share because I sure do love my current setup and it really has helped to make my outings much easier to manage. 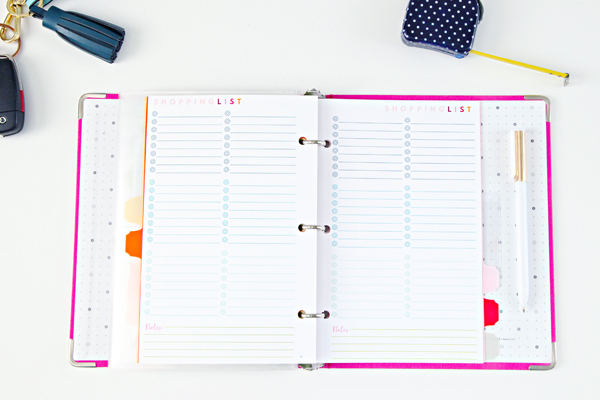 To assemble my shopping assistant, I began with a standard mini-binder from Container Store, which can also be found at Amazon, Target or any office supply store. Back when Staples offered a plethora of amazing Martha Stewart for Avery items, I picked up some secure-top page protectors and divider tabs. 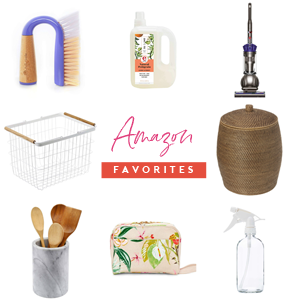 Although their offerings have since dwindled, Avery continues to offer a lot of similar options (again at Amazon, Target and office supply stores). I use page protectors/pockets to hold coupons and receipts, business card pages for store cards/gift cards, and added pages in the back for keeping track of my shopping lists. Let's take a closer look. I continue to utilize my meal planning printables every week for coming up with our weekly meals and grocery shopping list. It typically lives inside of my pantry door throughout the week for the family to easily reference (in one of these clear sign holders), but when I leave for my shopping trip I use a clip to attach the list to the inside cover of the binder. Although I use my phone for coupons every trip, I also receive a number of offers in the mail or print some from emails and websites or clip coupons from the newspaper and even the backs of receipts. I use one pouch to hold coupons for groceries and another for everything else (like haircuts, clothing, oil changes/auto maintenance, etc...). Each pouch was labeled with my label maker and my favorite clear/gold tape. When it comes to receipts, I generally only hold on to any that relate to my business and possible return items. I also like to keep my grocery receipts to check against our budget each month (and then they are recycled). I log my business expenses weekly and then permanently file away those specific receipts. Due to our location, I generally find myself over-purchasing for projects to be sure I have options and to prevent any last minute delays and trips. That also means I may have to manage quite a few returns and need to keep track of those receipts. Business card sheet protectors were the ideal solution for all of my store loyalty cards and gift cards. 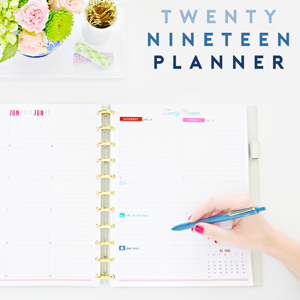 Because I may shop for project and home good materials at different times and locations than I will for our groceries, I keep those items on a separate list from our weekly meal planner. It is easier to utilize a separate printable to list the item and any specific details as a project progresses, or when multiple projects are taking place at once. And I love mini-tape measures because they are ridiculously helpful out on shopping trips to the hardware store or when measuring for bins and baskets (I find the small tape measures at craft stores, here is a similar one). 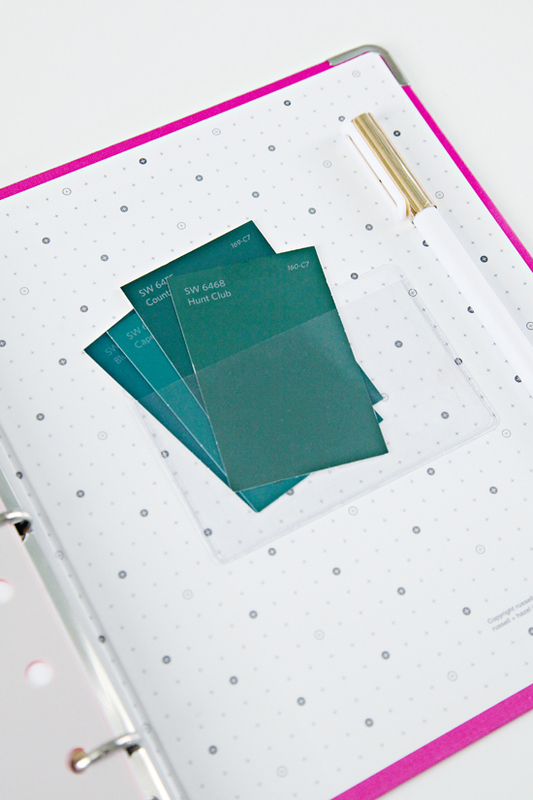 I have two free versions of this Shopping List printable for you, both designed to fit a mini binder! 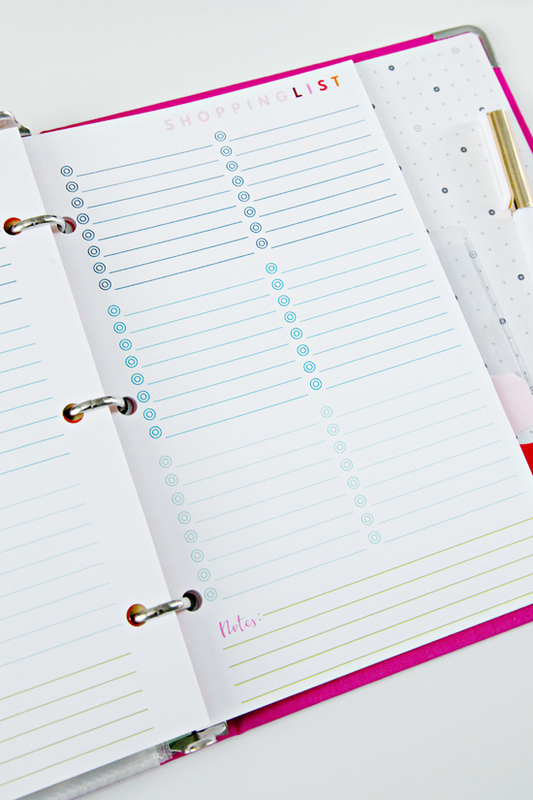 One to account for the center binder rings, and another that just allows the list to be centered on each page. The printable is designed to print on 5.5" x 8.5" paper, duplexed. On occasion, I am out looking for an item that works with a specific paint color or I have inspiration pics clipped from catalogs/magazines. A small pocket on the back cover was added to organize those smaller items. I also use a spare pocket to hold a calculator and pen as both come in handy at times. All of these items tuck away nice and neat and the binder is still able to close flat without trouble. And best of all, I am able to carry this mini-binder in the majority of my handbags and totes. And if not, it is still portable on its own. Thank you so much for this helpful post! 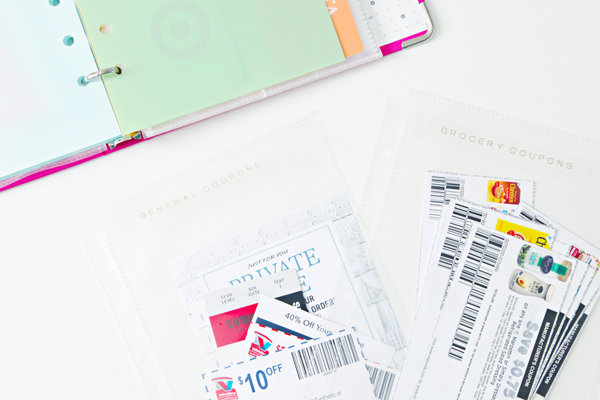 As a newlywed I'm trying to get our shopping more under control and I love the idea of different folders for different types of coupons & receipts. 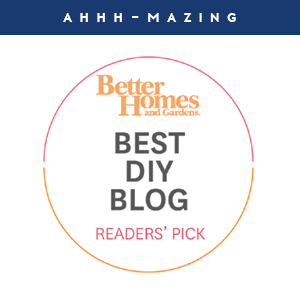 Your blog teaches me so much about home management! 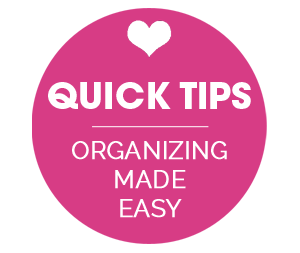 Love your method of organizing all the papers associated with shopping! FYI, most receipt paper is thermal paper. You can tell because it's smooth and a bit shiny, and a hard press with your thumbnail will leave a dark mark. It is actually not recyclable. The treatment that makes the paper printable by heat, instead of ink, contains BPA. I have the same kind of binder to organize my shopping trips. I recently found really pretty binders, dividers, and other fun stuff in the Target dollar spot!!! And with the low prices I don't feel bad if I want to change up my system or colors! Martha Stewart now has her own line at Staples. It's really nice stuff. You are not just speaking for yourself! Love the bag too. Thanks for asking. I need to know where you got your purse too! Hola!!! Me encantó tu calculadora!!! Muero de amor!!!! I have all my loyalty cards on an app called Beep'nGo. This helps me minimize what I have to carry with me. 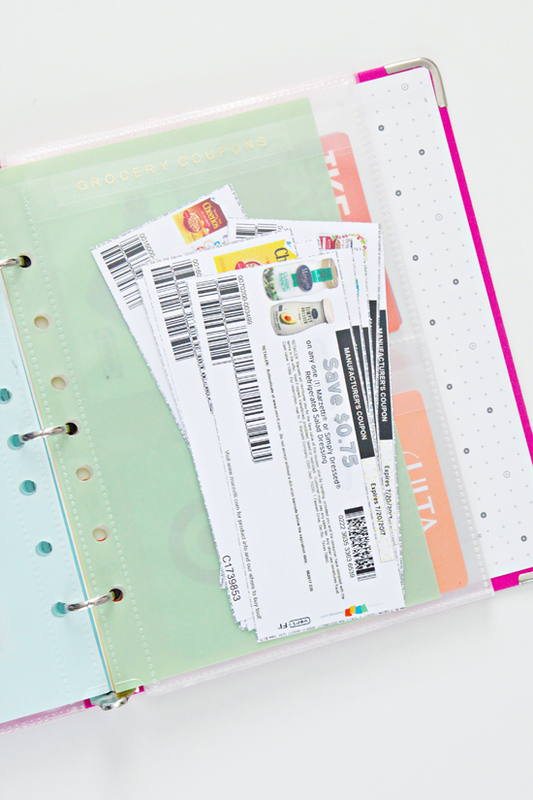 Love all your other ideas for organizing coupons! 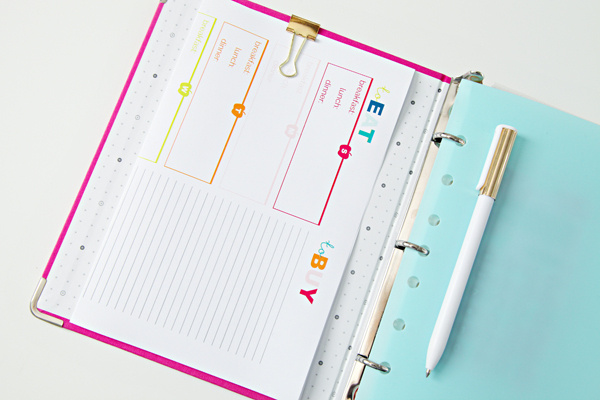 Love this mini binder idea! 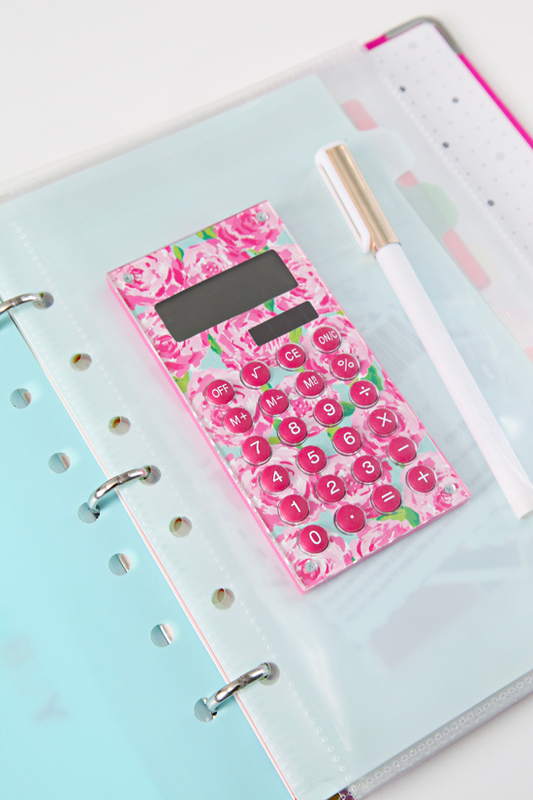 I plan to purchase one this week and get my receipt pile organized :) Im having a little difficulty finding the inserts ( pockets, dividers, etc.) that fit this small binder. I looked at the staples link and felt a little overwhelmed. Do you have a direct link for these accessories? Thanks much!! Thanks so much for posting this! 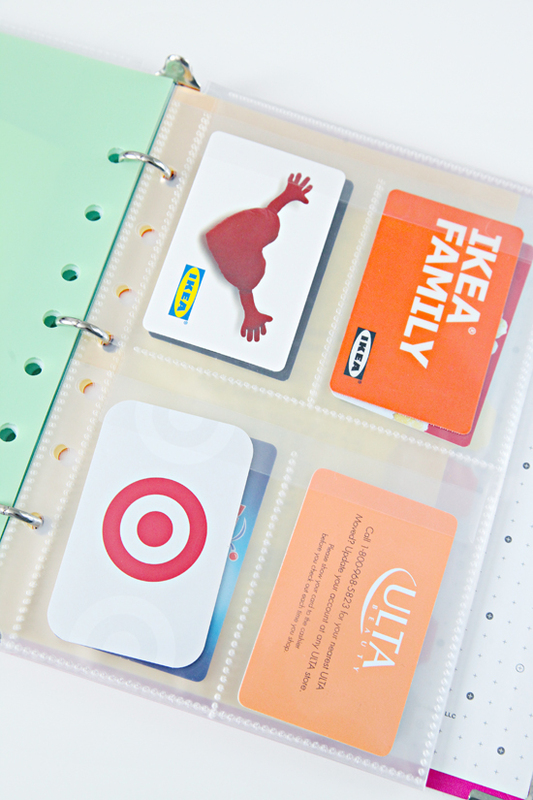 I've never thought to organize my gift cards and loyalty cards into a small binder. In fact, I didn't realize mini binders even existed! I've gotten started on this project, but unfortunately the Avery business card sheets I found at Staples don't work well for my cards. They slots aren't quite big enough and the cards slip out the top if the binder turns upside down. Any chance you could provide a link for the exact business card sheets you show in the pic? Yours looks much more secure than the ones I could find. Thanks so much! I am sorry to hear that Nicole. The ones I use were originally purchased at Staples awhile back as part of the past Martha Stewart with Avery line. Staples doesn't sell those exact pages any longer, but I found a seller on Amazon that still has them (in a blue color): http://amzn.to/2sijJSs. I will keep my eyes peeled for other options as well and be sure to update the post if I find anything. Thanks so much! Where do you find the 5.5 x 8.5 paper? And the business card holders in that size? Local office stores did not carry them. Silly to say I love the Calculator. Where can I score one?? Thanks Jen. Not silly, I love it too! I received it as a gift some time ago, it is a Lilly Pulitzer and I am not sure they sell them anymore. I had an old Martha Stewart junior sized disc bound notebook that I hadn't used in a long time and then I saw this post. I had most items on hand and now I use this daily. I have used so many of our gift cards and the kids love the shopping and treats! I get a lot of compliments on it at checkout, too! This is so simple and amazing! Thank you!